How many of you have struggled with understanding the section of Jesus's Sermon on the Mount that is presented in Matthew 5? It is commonly known as "The Beatitudes" or "Blessings of the Kingdom", and for years I have heard sermons or teachings on this particular portion of Scripture, and have always been left feeling as if the real meaning was missing. And then I read Matthew 5 based on the translation from Aramaic, and it was like a window was opened to the Father's heart! Before I show you the fullness of these important verses, I want to tell you why I think it is relevant to read the Aramaic translation. I believe that Jesus most likely spoke all three languages, depending on what was appropriate for a particular audience He was speaking to. Hebrew was most likely the language in which the Scriptures were spoken or taught in the synagogues. And it was spoken by the scribes, teachers of the law, Pharisees, and Sadducees, or the “religious elite.” So when Jesus appeared before the Sanhedrin, it is reasonable to assume that He spoke in Hebrew. Greek was the universal language of that time, and the language that the Romans, who had power over Israel during Jesus’ time, spoke. It was the language of the political class, so it is quite plausible that when Jesus was taken before Pontius Pilate, He spoke in Greek. Aramaic was a particular Galilean dialect spoken during the late Second Temple period, at the time of Jesus and His Disciples. It was the language of the common people. According to the Associates for Biblical Research, and as written in the Gospels, Jesus' earthly ministry centered around the Sea of Galilee. While important events occurred in Jerusalem, the Lord spent most of the three years of His ministry along the shores of this freshwater lake. Here He gave more than half of His parables, and here He performed most of His miracles. Seven of the Twelve Disciples were from the Galilee area, and tradition tells us that the Sermon on the Mount took place on the northwestern shore of the Sea of Galilee, between Capernaum and Gennesaret. Since Jesus' ministry centered around the common people in this particular area, it is quite logical [to me] to take a look at how this important message would have been delivered in the language they spoke and understood ... Aramaic. Before I give you that translation, I would like us to consider that the Sermon on the Mount was presented in the context of being the Constitution, if you will, of the Kingdom of Heaven. 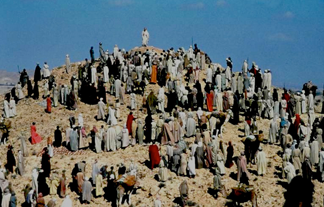 Jesus is telling the crowds that the Ten Commandments serve as the Law on earth, but there is a higher concept of the Torah that portrays all that God expects and provides for those who yield to Him. In essence, God offers promises of power to fulfill all that He asks of us. In this important Sermon, Jesus puts the emphasis on the inward transformation of our hearts by the grace of God, rather than the outward duty to obey the Law. Jesus is telling all of us that God's Kingdom is available to those who will learn His ways and offer ourselves to Him in full surrender. What wealth is offered to you when you feel your spiritual poverty! For there is no charge to enter the realm of Heaven's Kingdom. What delight comes to you when you wait upon the Lord! For you will find what you long for. What blessing comes to you when gentleness lives in you! For you will inherit the earth. How enriched you are when you crave righteousness! For you will be surrounded with fruitfulness. How satisfied you are when you demonstrate tender mercy! For tender mercy will be demonstrated to you. How blessed you are when you make peace! For then you will be recognized as a true child of God. How enriched you are when you bear the wounds of being persecuted for doing what is right! For that is when you experience the realm of Heaven's Kingdom. How ecstatic you can be when people insult and persecute you and speak all kinds of cruel lies about you because of your love for Me! Do leap for joy -- since your heavenly reward is great. For you are being rejected the same way the prophets were before you. Can you see the bigger picture here? Instead of our English translation that repeats "Blessed art thou", the Aramaic provides independent and separate blessings for each of the Beatitudes. The word for "blessed" in Aramaic is toowayhon, and it implies more than a universal blessedness. It suggests, or intimates, fuller meanings of "enriched, happy, fortunate, delighted, blissful, content, and of course, blessed". Now, I better understand the full implications of these blessings. These verses now speak to me of total reliance upon God for everything. When I wait upon the Lord, I am actually mourning for being away from Him, and I will be comforted when I finally receive what I have been longing for. When I am gentle [flexible], or meek, and claim nothing as mine, everything will be given to me. And I love the connection that is made between righteousness and fruitfulness! And I was amazed to find that the Hebrew and Aramaic concept of mercy is that it comes from our innermost being. In fact, the root word for "mercy" is the root word for "womb" -- where we are transformed from spirit being into human being, as Jesus knits us into the womb. (If you doubt this concept, remember that Jesus says He knew us before He knit us in the womb -- I believe as a spirit being, made in the image of our Father). I also understand more fully the concept of being pure of heart, for I will progressively see more of God as I mature in my faith and experience encounters with Him. Then the final verses speak of being persecuted and insulted because of the way we show our love for Jesus! But we are to live in such a way that people will have to lie when they speak evil of us. I am so thankful for this new and refreshing translation of the Beatitudes, because it is important that we understand the full picture of Kingdom living. I will no longer read these verses with a veiled understanding, but can now delight in the picture they paint of how God wishes to bless us if we surrender fully to Him, and seek and embrace His Kingdom. I can only imagine what hope this gave to the crowds of simple and humble people who were hungry for these promises of the Kingdom. I am no different from them, and I suspect you aren't either. We all long for the hope of Heaven! So now, read this ancient, yet fresh, version of the Beatitudes again, and anticipate all that will be ours when the fullness of God's Kingdom comes with our Savior! Psalm 130:5 "I wait for the Lord, my soul waits, and in His word I hope"